I read about this dunnowhatisname rice cake on drliew.net‘s the other day.Â I can’t find the post at the moment but it sounds like some fried koay kark method of frying. So, out of curiousity, I bought a packet yesterday.Â When I got home, I found that I need to soak the thing for 12 hours in summer and 16-20 hours in winter.Â Â OMG, that’s scary man.Â 20 hours is like almost a day and I wonder if the thing will turn foamy because rice spoils fast due to its high sugar content. Do you see that it even recommends to be soaked for FIVE TO SEVEN DAYS?Â Yikes. Now, I am not too sure if I want to start soaking them because I don’t know when will they ever get soften.Â I usually don’t cook on weekends so I hope the thing doesn’t drag till Sunday to get soften. So, peeps, anyone of you ever eat or cook this before?Â Can ask your grandma about this?Â Please?Â I got no grandmas to ask.Â Thank you!Â BTW, what’s the name? in cantonese this is called “park kor meen” which is also known as “shanghai nien guo” to the shanghainese. my mom cooked this once in a while. i’ve never done it before but i roughly know how she prepares them. first you soak them accordingly. then you boiled them until al dente or to the texture you like. drain them and you can fry them ala KL’s hokkien mee style or just simply cook them this way http://babeinthecitykl.blogspot.com/2004/11/stir-fried-mee-hoon.html. hope this helps. That’s a Foochow dish! In Mandarin, it’s called ‘bai2 guo3 gan1’. My Shanghainese friend told me they eat it like nian gao in Shanghai, ie in deep fried pieces. Anyway, I’ve found a way of lessening the time needed to soak the rice cakes. Put the rice cakes in a container with some cold water, then add boiling water (so the water is very warm – towards the hot side). Change every now and then once the temperature drops until not warm. Usually, with these frequent changes of water, it takes me approximately half hour to get the rice cakes ready – and that’s in winter! You’ll know they’re ready when they’re al dente to the touch. 1. 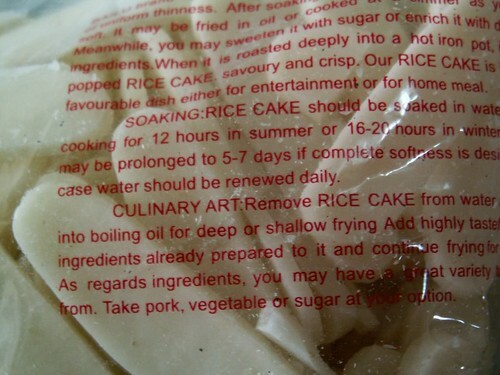 Crack an egg into the prepared container of rice cakes and mix thoroughly*. 2. Saute some garlic in oil until fragrant. 3. Stir fry some ingredients – my mom usually uses leeks, some prepared minced meat, egg(s) and those tiny clams**. 4. Pour the rice cakes in and stir fry. 5. To season, use the ‘juices’ from the can of tiny clams +/- some light*** soy sauce and some oyster sauce. 6. Remove from wok/pan. Don’t throw away the crispy parts – those are the best! * To make the end product sticky, otherwise omit this step. For me, I’ll always find non-sticky rice cakes to be not the real thing. ** Those really tiny black ones that come in a can. *** My aunt uses dark soy sauce instead of light soy sauce whereas sometimes I don’t even put soy sauce! This is a very versatile ingredient; I’ve found it works with pakchoy and pork luncheon meat too! Hope you like it! i remember having this many years back in this place called Hoi Kee (back then I had not reverted to Islam yet). i remember my mom bought some, and well, we didn’t exactly follow the soaking instructions, and that is not a good idea.. the noodles just didn’t turn out. I’ve tried different methods of cooking this and the following works best for me: Buy “fresh” rice cakes in the vacuum pak instead of the completely dried variety. Place in glass bowl, cover with water and microwave until softened, but still chewy. Do not overcook or it will be mushy. Stir fry, with meat and vegetables as you would chow mein. Not sure if you are still interested in this. There are a lot of recipe for this Shanghai Nian Gao in chinese but few in English.